Preacher is coming to a close on AMC. The network has officially decided to call it quits on their adaptation of the beloved Garth Ennis comic book series of the same name after the upcoming fourth season. But it appears as though they intend to end things with a big, apocalyptic bang, based on the first teaser for the show's final season, which also brings with it the official premiere date. Seth Rogen, who co-created the series with his creative partner Evan Goldberg, took to Twitter to reveal the teaser. It's bright, colorful and very mysterious. It's clear an apocalyptic event is on the horizon as a voiceover declares, "Time is running out for planet Earth" before a mushroom cloud engulfs the screen. It's then revealed that Preacher Season 4 will debut on August 4, while words flash across the screen that help to drive home the point that this is going to serve as the show's swan song. It doesn't appear as though the show is ending prematurely by any means. While Preacher hasn't quite earned the same huge ratings that AMC's other comic book series, The Walking Dead, has, it's been a decent hit for the network, while also garnering a good deal of critical praise. But it's one of those things where there was a finite story to tell, at least when looking at the comics. So it seems the creative team has decided to send it off in proper fashion before it overstays its welcome. The comic book was released under DC's Vertigo imprint starting in 1995 before concluded in 2000. It was published for a total of 66 regular issues, as well as four one-shots and a miniseries. Created by Garth Ennis and Steve Dillon, the story centers on a Texas preacher by the name of Jesse Custer who has become completely disillusioned with the beliefs to which he had dedicated his entire life. However, once he is taken over by a spiritual force known as Genesis, giving him the ability to make people do whatever he utters, the man begins a violent and riotous journey across the country. The TV series has taken more than a few liberties with the source material but it's been faithful to the larger themes and spirit of the comic, according to many critics and viewers. The series stars Dominic Cooper as Jesse Custer. The ensemble also includes Ruth Negga, Joseph Gilgun, Ian Colletti, Graham McTavish, Pip Torrens, Julie Ann Emery, Malcolm Barrett, Betty Buckley, Colin Cunningham, Jeremy Childs, Liz McGeever, Jonny Coyne, Adam Croasdell and Prema Cruz. 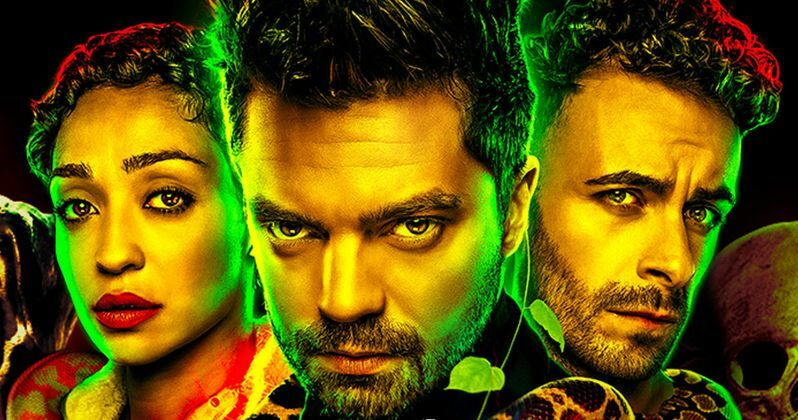 Odds are, we'll be seeing a full trailer for the final season of Preacher over the summer, most likely during San Diego Comic-Con, which we'll be sure to bring your way once it's made available online. In the meantime, be sure to check out the first teaser from Seth Rogen's Twitter account below.